Portimao hosts excitement for the full weekend. As fans flock to the Autodromo Internacional do Algarve for Round 10 of the MOTUL FIM Superbike World Championship this weekend, they have a lot of off track excitement awaiting them following the stunning racing battles they are set to be treated to. Not only will the Paddock Show once again be a main attraction, there will be fan zones, parade laps and much more. Situated a short drive away from the Algarve coastline, fans will have free bus transportation to the circuit on Saturday and Sunday with five routes. From Vau, Lagos, Carvoeiro, Albufeira and Faro, there will be no excuse to miss out on action around the 4.5km roller-coaster circuit. If the buses aren’t enough, then camping at the circuit from Friday to Sunday is an option, where you can enjoy three days of racing, music and the full SBK® experience. Situated behind the Portimao stand, it won’t be anything to miss. It’s also possible to make it a family weekend, as children up to 16 go free when accompanied by a paying adult. Once at the circuit, there will be a fan area behind the main grandstand with a motorcycle exhibition, merchandising and shops. Or venture into the paddock and you’ll find the Fan Zone with product displays, Prosecco distribution, WorldSBK merchandise and a mini bike track for kids. Take in some unique views of the sensational undulating track with access to the VIP Tower, open all weekend. Or take in another unique viewpoint in the MOTUL Action Box and watch the WorldSBK bikes head from the end of the racing through to Parc Ferme, in possibly the most adrenaline fuelled moments of the weekend. From here you could get a unique version of Miguel Oliveira’s parade laps before the WorldSBK races this weekend. Want to see more behind the scenes? Add to your weekend experience with the Pit Walk tickets on Saturday and Sunday. 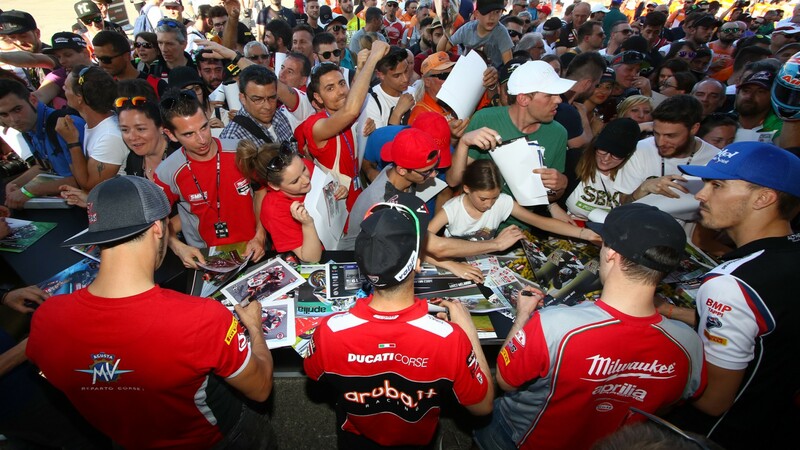 Open on Saturday at 15.40 and Sunday at 10.35, it offers a chance to take a look behind the scenes into the working garages, and even get an autograph or photo with your WorldSBK racing heroes. On top of all this, the Paddock Show will once again provide the entertainment throughout the entire weekend. On stage action begins on Friday with a series of chat shows, interactive quiz shows and the Opening Day shows. Saturday is when the real action beings, as riders ride through the paddock into Parc Ferme before heading onto the Paddock Show stage for the all new Podium Shows. Offering the first chance to hear from the rostrum finishers in all classes, it’s not one to miss. Keep up with all this and much more as the WorldSBK championship returns this weekend in the Nolan Portuguese Round, from 14th – 16th September. You can keep up with all on track action and reactions with the WorldSBK VideoPass.